Negative Integers are the whole numbers less than zero (i.e. -1, -2, -3, …). This integers have a value less than zero. So, a number which is less than zero but not a fraction or a decimal is called a Negative Integer. The number 0 is simply an integer. It is neither positive nor negative. The negative integers are the inverse of the positive numbers. 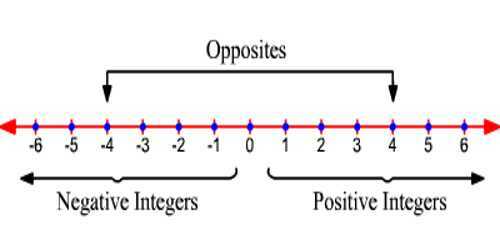 The negative integers are made to have the separate values found in a number line. The negative integers are less than zero, denoted as (e.g. -5). The zero is neither a positive nor a negative number. 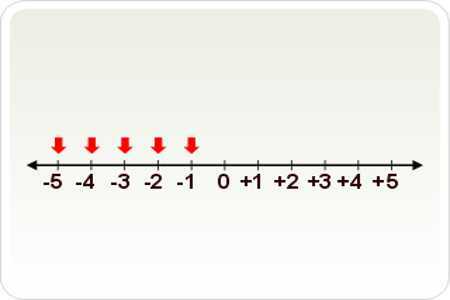 The number line represents both the positive and negative integers. The negative numbers are representing from the left to right. The sign will be that of the larger number. Remember adding a negative number is the same as subtracting a positive one. If you get confused, it often helps to write a positive number in an equation first and then the negative number. This can make it easier to see whether or not a sign change occurs. If you’re multiplying a larger series of positive and negative numbers, you can add up how many are positive and how many are negative. The final sign will be the one in excess. All integers (either positive or negative) have a counterpart that is the same distance to zero, but is on the other side of zero. This is one of the characteristics of integers, where we say that all integers have “opposite” counterparts. For example, -7 and +7 are the same distance from zero, so we say that they are opposites of each other. There is no distance between zero and itself, and it’s neither to the left nor the right of itself, so once again we say that zero is neither positive nor negative!